large order of take-out soup. That's what happened during the one-week-plus while I was fighting a cold. There wasn't much happening with food. Most of it was canned, or leftovers from the rare time we didn't eat something prepared, or out of a paper box. Even when we did cook something, I wasn't exactly "with it" enough to blog about it. Meredith made some muffins and emailed me her recipe for later; I took a picture with my phone before I ate it. We worked together to make the burgers with potatoes (we still have to eat! ), and I took a couple pictures along the way (that recipe is burned into my brain, anyway). 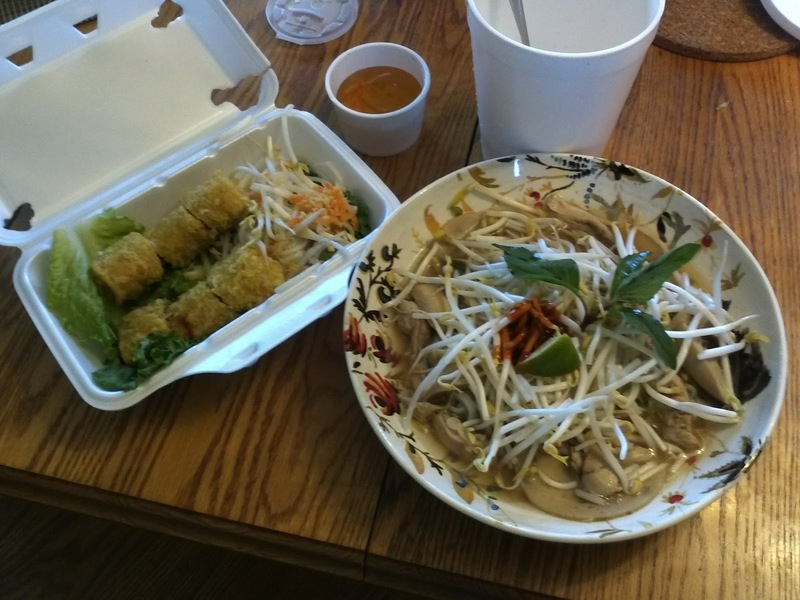 So when Meredith drove me home from a doctor's appointment, she insisted that we get some take-out Pho for lunch because she wasn't going to crack open another can of soup. Who was I to argue. I couldn't stand the prepared stuff (or even worse, packaged, powdered stuff) either. I just wanted to make sure that it was eventually reported. When we're in downtown Toronto, we get our Pho fix from Pho Hung, on Spadina - that's my benchmark. Now that neither of us work anywhere near there, however, we don't exactly visit often. That's where Vietnamese Delight comes in. It's close to home, very reasonably priced, and their spring rolls are excellent. Vietnamese Delight is in the Skymark plaza at Finch and Don Mills, so it gets good traffic all day from local businesses, Seneca College and the local residents. The interior was recently renovated, so it's actually a nice date spot as well. Their menu isn't huge by Pho Hung standards, however, it has a good selection of spring rolls, Pho, skewered meat, and other Vietnamese dishes. Our take-out order that day was the shredded chicken and Vietnamese sausage noodle soup (we split a large), and some deep-fried spring rolls. I keep forgetting that the Vietnamese sausage served there is more of a sliced deli meat, and not like a European sausage, but that didn't disappoint me. The spring rolls were wonderfully crispy - not oily at all, and are served on a bed of lettuce leaves with some noodles and sprouts. The soup was nice as well. Since it was take-out, the meats and broth were packed separately from the noodles and onions, which were also packed separately from the garnish (sprouts, lime, and basil leaves). The soup wasn't too salty and there was just enough sauce (combination chili/hoisin) to add to the flavour. It was quite comforting to eat a well-made soup when I was feeling so lousy. I like to think that it contributed toward my recovery. Bootnote for a laugh: on a subsequent visit with the kids, our eldest suggested that he share the lemon-grass chicken and pork with rice with his toddler brother, saving the cost of buying him a separate entrée. The toddler ate the chicken and pork while the eight-year-old ate the plain rice. We are very lucky in Toronto. You can find almost any cuisine in the world here. Even if there's only one location, or if the ingredients require a bit of searching. Hope you are feeling better! Pho can be a great comfort food!